This week Edmund Honohan again highlighted the need for a legal aid system in repossession cases. THE MASTER OF the High Court has warned that thousands of people coming through the courts may lose their homes if stronger legal supports are not put in place to help them when they face off against banks and vulture funds. 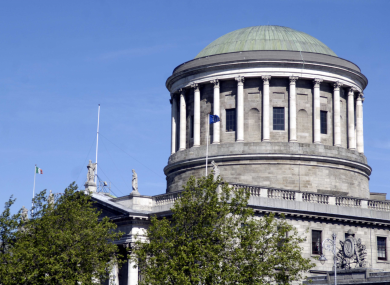 Edmund Honohan had a number of cases on his list on Wednesday in relation to possession orders on family homes. Over the course of the morning, he criticised the banks for aggressively pursuing family homes, butted heads with the barristers defending them and highlighted failings at Circuit Court level where the possession orders had been granted – in many cases without any detailed consideration of the loan terms or the circumstances of the debtors. In the majority of cases, the people on the Master’s list were representing themselves in court. One of these lay litigants was Caroline O’Toole, a mother of two young children who lives in Carlow. A possession order on her home was granted by the Circuit Court in April last year, but there was a stay on it for nine months to allow O’Toole to engage with the Money Advice and Budgeting Service (Mabs). She told Honohan that she believed the judge had taken pity on her that day as she was pregnant at the time and was “very emotional”. KBC Bank Ireland was directed to contact her and engage in talks during that time. I did everything that was asked of me, I have been trying to pay €650 [per month] but they have refused to deal with me. She said the bank waited until the nine months the Circuit Court judge had given them to try to reach a deal were almost up before contacting her. Honohan read out parts of the letter KBC sent the woman, laughing at the bank’s wording as he got to the part about the bank wishing to “stress the importance of active engagement”. O’Toole told the court that she met with one of the bank’s support officers at her home in January this year and that she was told she would “just have to get another mortgage for €300,000″. The mother-of-two, who works for the HSE, said she can afford to pay €650 and she provided Honohan with a standard financial statement from Mabs. She explained that she and her then partner had taken out the mortgage in 2007 and that he was made redundant the day they moved into the property. “In 2009 he developed a drinking problem and I kicked him out,” she said. She told Honohan she had been “struggling on her own” to pay the mortgage and had been asking for a split mortgage since 2015. I don’t have anywhere else to go, this is the only home I have for my children. The Master said even the government accepts now that evictions cannot take place “just because you are owed a few bob”. This is about whether society has a pressing need to evict 10,000 people. That’s one thousand times today’s list, one thousand days like this. Honohan said 10,000 was the minimum figure, because the banks appear to have a “pressing need” to evict debtors in arrears from their homes. The High Court Master also heard from another lay litigant who told him her husband had mortgaged their family home for the last 32 years without her knowledge – and had forged her signature – four months before they separated. He is also named in the proceedings, but she said she has not had any contact with him since 2002. “My husband got it [the loan] on the pretext of doing up the home and used it for his own business venture,” she said. The woman said she had never made a payment on the loan. I only became aware of it when I started getting papers from KBC bank. She told the Master that the provision of legal aid would be helpful. He agreed to extend the time for her to file a notice of appeal to the possession order on her home. “Two months to consult Abhaile, who will give you €200 of legal advice,” he said. This scheme offers vouchers to struggling debtors who can then visit a solicitor or legal adviser. However they are usually only covered for one or two advice meetings and still have to represent themselves in court unless they can afford to pay for a solicitor and barrister for their proceedings. Honohan has previously described the scheme as “a scam” that was only set up so the government could avoid having to fund a proper legal aid system for repossession cases. In February he said it was a “sick joke” that people at risk of losing their homes were being directed to this service under the impression that it would offer a solution. He had started his morning by refusing to continue until a barrister for Bank of Ireland did the maths on his yellow legal pad to add up the amount of land in six folios the bank was attempting to gain possession of. Later, he raised his voice as he told barristers at the front of his court to make room for a lay litigant, Mary Fahy, to sit among them so she should be on a more equal footing. “She’s entitled to sit in the front row,” he told them. Honohan questioned whether, under the European Charter of Human Rights, he could allow the case to proceed without the provision of legal aid for the woman. “Is this all above your head?” he asked her after a back-and-forth with the bank’s barrister. “Most of it,” she replied. He asked whether the judge in the Circuit Court who granted the possession order on her apartment in Galway had read her mortgage contract and told her there were no unfair terms in it. He asked whether the judge in Circuit Court had spoken to her about her domestic circumstances. He asked whether the judge had asked her how much she could afford to pay the bank. The bank’s barrister was keen to push ahead with the case “on an expeditious basis”, despite the woman’s request for more time. “Why does it need, for society to operate, for this matter to be dealt with expeditiously?” Honohan asked. In each of the cases before him Wednesday morning, Honohan granted a time extension for the lay litigants involved. But he pointed out that this was as much as he was able to do, and once they moved to the judges’ list, they would be on their own again in the battle with the banks and their teams of barristers. Email “'One thousand days like this': High Court Master questions banks on their 'pressing need' to evict people”. Feedback on “'One thousand days like this': High Court Master questions banks on their 'pressing need' to evict people”.